Saved chart is an independent chart that can be created and then added to any dashboards and presentations as many times as you need. From the Library page, click the plus button at the bottom right corner of the page. Select Saved chart. You’ll be redirected to a page to choose a dataset. You can also click any dataset or integration and choose Create saved chart option – in this case, you’ll miss the step of choosing the source for your chart. After you’ve pointed out a dataset, you’ll get into the Chart designer. Saved charts are created the same way as usual ones. Read this article to learn more about how to build a chart in the Chart designer. After you’ve built and saved the chart, it will appear in the Saved charts page. You can find it from the Navigation pane. Saved charts are convenient when you need to create a chart at once and then add it to many dashboards and presentations. Let’s consider a situation when saved charts would be a perfect fit for you. For example, you have a dashboard where sheets show sales by months. Probably these sheets must consist of the same charts represented different data. You’re able to create saved charts at once, add them to the sheets, and then create dashboard filters to filter charts data by months. Saved charts can be added to many dashboards and presentations. All the changes made in saved chart will be represented in the dashboards’ and presentations’ chart copies. Saved charts are created as usual ones, but stored on the Saved charts page, while usual charts are attached to dashboards and presentations. The major difference is that usual charts can be edited within a dashboard, but saved ones are not. It means when place a saved chart to a dashboard or presentation, you can’t get into the Chart designer as in case of usual charts, set filters, sorting, and formatting of a saved chart from a dashboard. However, you’re able to open saved chart in new window and make all the changes you want. 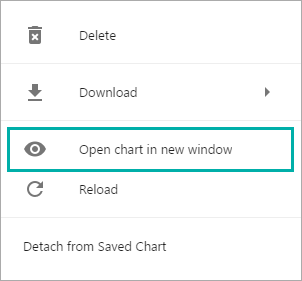 If you need to customize a specific saved chart within a dashboard or presentation, you can detach a chart from saved chart and make it editable (make it “usual”). Keep in mind, if you’ll decide to detach a chart, it’ll lose all the advantages of saved chart and acquire usual chart characteristics. 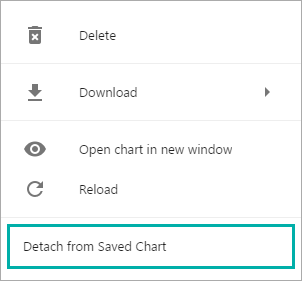 If you need to detach saved chart, right click it from the dashboard page and choose Detach from Saved Chart. Saved charts may contain calculated measures, as usual charts. When you add saved chart to a dashboard, it acquires all the calculated measures of usual charts existed within the dashboard (in case of the charts are based on the same dataset), and vice versa. Try to avoid duplication of the names of calculated measures!